It would have been difficult to have a tour guide who loved his (or her) experience at St. Louis University more that our tour guide, JP, a second-year student from Texas. Founded in 1818, SLU was the first university west of the Mississippi river and was ranked a top 5 Jesuit Catholic university (along with Georgetown, Fordham, Boston College and Marquette University). 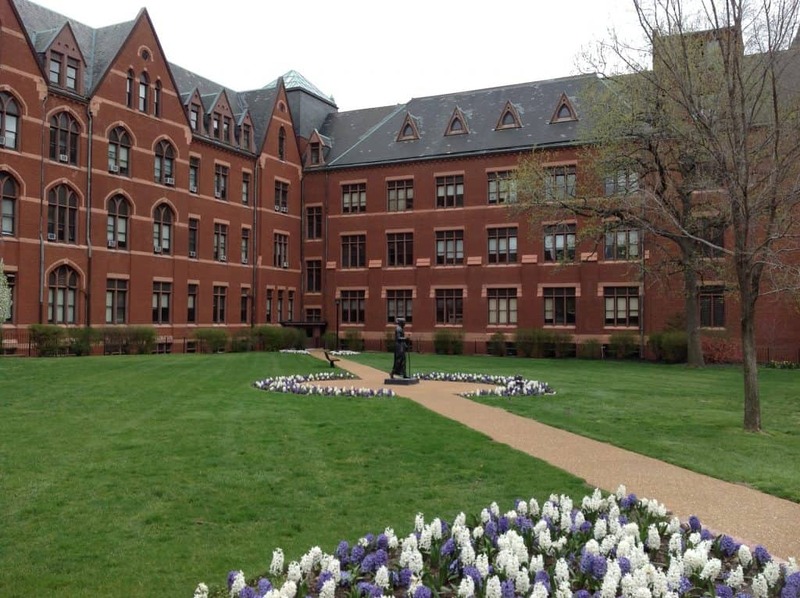 There are about 8,800 undergraduates on this very attractive campus, right in the middle of St. Louis. SLU has strong science and engineering programs, and had the first federally licensed school of aviation. Locally-based businesses including Monsanto and Anheuser Busch, as well as the zoo and botanical gardens, provide interesting hands-on internship opportunities for students. Community service is an important facet at SLU, which has the largest Alpha Phi Omega (national service fraternity) chapter in the country. School spirit runs high at SLU, where students cheer on their Division I sports teams. The mascot is the Billiken, an elfish creature that is one of a kind. There seems to be some debate about what exactly a Billiken is, and where it came from. You can read a few explanations here and here. “Still Deciding” is the most popular major at SLU, and for students in this category, courses where students can explore different majors meet weekly. “Still Deciding” students also have their own advisors to help them get to the next step (deciding!). Strong programs include aviation science, aerospace engineering, biology, communication and nursing, and growing majors include African American studies, anthropology, emergency management, public health and sports management. SLU’s Master’s in Health Administration program is Top 10. A complete list of majors is here. There are both honors and scholars programs – the pre-law scholars program gives students a guaranteed spot in SLU’s law school if grades are maintained at a certain level, and the pre-med scholars program gives students a guaranteed interview at SLU’s medical school. Study abroad is very popular and SLU has a full campus in Madrid, so several hundred students travel together to study at this campus every year. Just under 20% of students participate in the Greek system, and about half of undergrads live on campus, some in themed living/learning communities. Off campus housing is in the immediate area. 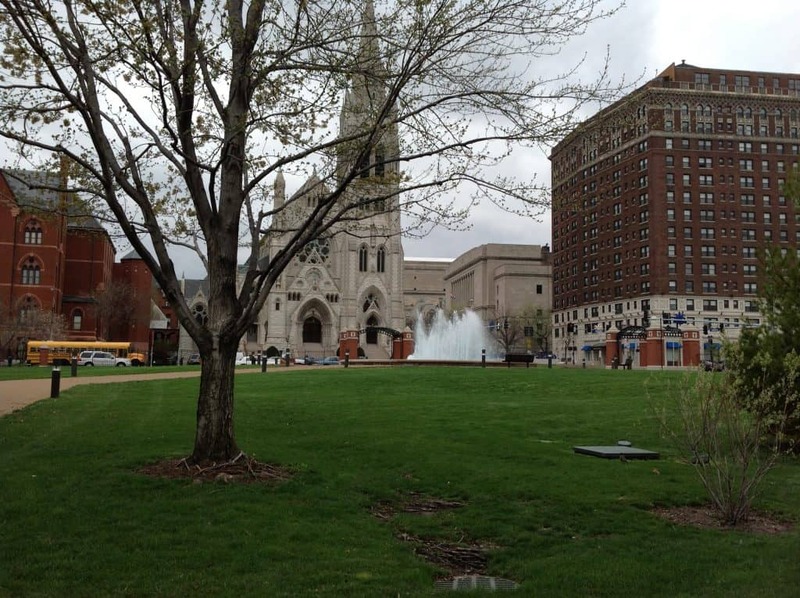 SLU’s campus is beautiful! You definitely do not feel like you are in the middle of the city; it’s truly an urban oasis. While the dorms are not the newest, they are fully functional and outfitted with wifi, cable and free laundry! The classrooms are technologically modern and there are only three lecture halls on campus, with the largest lecture about 150 students. Our tour guide JP exchanged greetings with several dozen people as we walked through campus, which says something about a school of this size. He told us the professors get to know students and he has never felt like “a face in the crowd.” SLU had a comfortable, positive feel to me!